I was at a lecture last night, gettin my learn on, when up pops one of these monstrosities in front of me. Of course, I could no longer see the speaker. And, being the lady that I am, I refrained from taking her hair down myself. 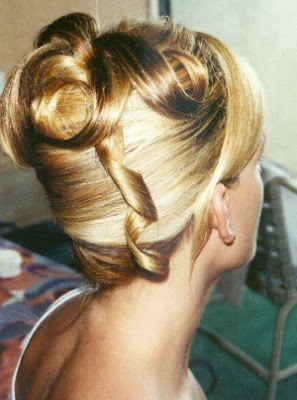 Let it be known divas, an up do is a complex, trashy, glorious way to express the emotions of your head. But it is NOT appropriate for stadium seating. When you're at any seated venue, a lo-po or a down-do are the only proper choices.